From our first meeting to your finished home - we will be with you every step of the way. We take deep satisfaction in our approach - listening to your ideas and goals, understanding, respecting and partnering with you, our client. 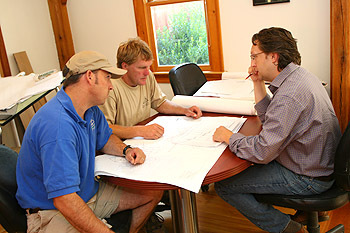 Your participation in designing the home of your dreams is welcomed with a true sense of teamwork. We know you've done your homework and share our reverence for top quality materials, beautiful workmanship and uncompromising attention to detail. Whether you come to us with a finished plan or a folder of ideas and magazine pages you've gathered over time, put it in our hands with confidence. Our design and fabrication facilities share one roof - a working concept that's helped earn us a flawless reputation for excellence. You enjoy a seamless, efficient, cost-effective process and the easy flow of information among your team. As opposed to stock or standard house plans, we prefer to design and/or build a completely custom home. It has been our experience that an individual who chooses a timber frame home is much more in tune with the idea that their home is a representation of their life and lifestyle. We offer a complete design service, as well as, being able to work with plans supplied by our clients. We have a library of plans from previous projects, as well as, volumes of books and magazines to aid you in the design process. We work with our clients in various stages of the process, depending on where they are when they come to us. However, they all started the process the same way - with a phone call. So call us at 800.471.8715 or email to start the journey of creating your dream home.